Online fashion giant ASOS managed to hold pole position on the list of most-visited UK apparel ecommerce sites between August 2017 and February 2018, besting a number of high street retailers, according to new research. Yet a new study has found that the gap at the top is narrowing, with traffic volume for second-placed John Lewis growing 39% over six months, while third-placed Marks & Spencer showed an 8% increase. The figures, from online data provider SEMrush, illustrate a raging ecommerce battleground, where department stores are going head-to-head with fashion retailers in a campaign for visitor traffic. The growth in site traffic for Marks & Spencer, the UK’s biggest clothing retailer, might come as welcome news to company executives who reported poor online sales growth for non-food goods earlier this year. However, the results were not so favourable for fourth-placed Next, showing an 8% decrease in site traffic over the same time period. This follows news that the company is set to be overtaken by fast-fashion chain Primark as the second biggest clothing retailer in the UK. British department store Debenhams came in fifth - up 25% in six months - while sports-goods retailer Sports Direct was sixth. After managing to edge out ASOS for the top spot in SEMrush’s global fashion ecommerce study, Swedish clothing company H&M ranked in at number seven on the UK’s list. The biggest riser in the list was Zara, growing an enormous 43% in six months and climbing five positions to finish eighth on the list. 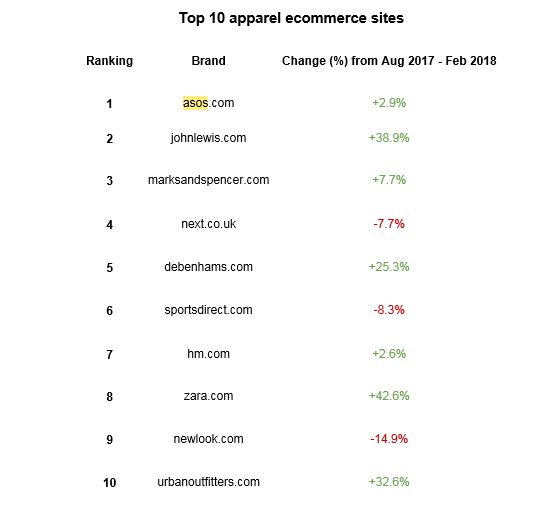 New Look manage to cling on to spot number nine, but a 15% decrease in site traffic might set alarm bells ringing for the British retailer. Urban Outfitters completed the top 10, following impressive growth in site traffic of 33%. Ultimately, the figures show a growing trend of department stores making significant advances on the world of apparel ecommerce, often at the behest of high street fashion retailers. ASOS has held the dominant position for quite some time now, but the latest trends may suggest that things are rapidly hotting up at the top. In order to build online brand awareness, it is important to gauge the scale of competitors’ presence in relevant markets. Businesses cannot truly be aware of how they are performing if they are not able to benchmark themselves against their competitors. In addition, site traffic trends provide valuable metrics for advertisers looking to optimise their total reach. In light of this data study, advertisers may need to re-evaluate their approach to the UK fashion market where traditional department stores appear to be overtaking high street brands in ecommerce traffic.